I am currently reading “Savoir goûter le vin” (Know how to taste wine) by Enrico Bernardo, an Italian sommelier awarded world’s best sommelier in 2004. It’s a very interesting book with 3 parts, the first one focuses on all the aspects of wine tasting, with very detailed descriptions of all the different steps. In the second part Enrico reviews wines from the great vineyards in the world and in the third part he gives the reader practical advices on how to store, buy, serve wine. So far I’ve been through the first tasting step: the appearance (the French call this step “l’œil”, the eye). Remember, during our first wine tasting we learned to pay attention to the colour of the wine (in French ” la robe”, the dress). But there are actually 5 more steps to consider, in order to describe the appearance of the wine. Sheens, showing the evolution stages of the wine. To see the sheens you should tip up your glass and look at the colour of the edge of the disc on the surface of the liquid. Clarity, showing the age and the purity of the wine. A young wine will be particularly bright whereas an older wine will be more opaque. Carotene(although, I’m not sure it’s the appropriate term in English) which is the actual amount of colour in the wine. To estimate the concentration of carotene you need to look through the wine, tipping up your glass on a piece of paper, can you still read the text? If you can, then your wine has a high transparency and a low carotene, meaning that your wine is at a good stage to be drank. Fluidity, helps value the percentage of alcohol and/ or residual sugars. This is the step during which we look if the wine has legs. If your wine has many and slow legs it means that it’s high in alcohol and/or sweet. Fizziness, of course this step is only for sparkling wines. We would judge the quantity, persistence and size of the bubbles. To be honest, I knew about these steps but I keep forgetting about it. 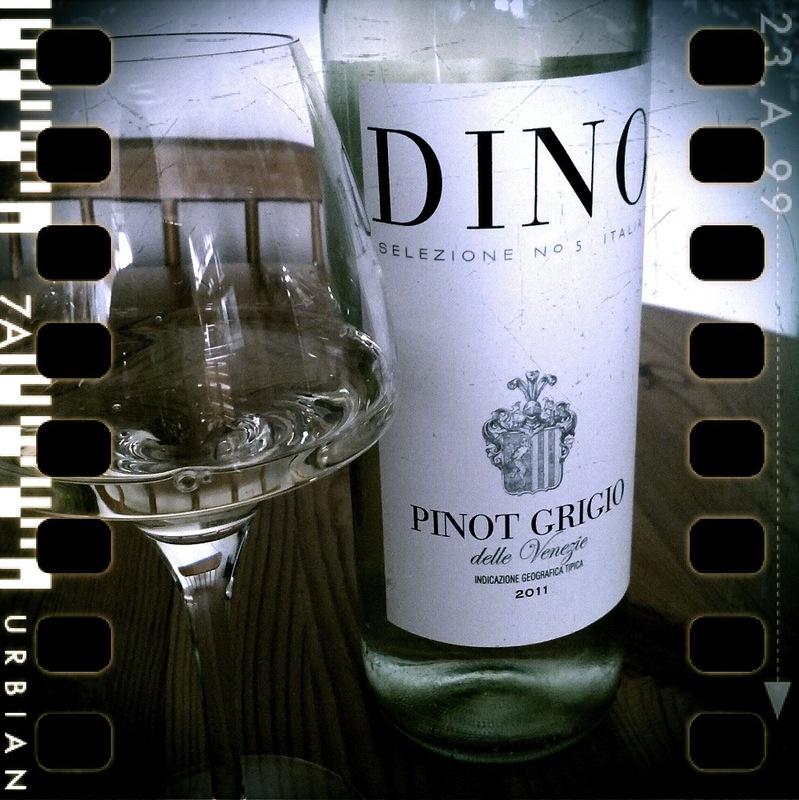 So from now on I’ll try to do the full description of the appearance, starting with the Pinot Grigio. A classic Pinot Grigio with a bright pale straw colour, gold sheens, transparent and fluid (no legs). On the nose it has light citrus aromas. This off dry and crips wine is light bodied with citrus and pear flavour and a medium length on the palate, it goes well with most of dishes. I accompanied it with baked white fish with olives and tomato sauce. Check the receipt on Jamie Oliver’s website. This bright Pinot Grigio has a fruity nose with citrus aromas. It is crisp and dry on the palate and very refreshing. A higher class Pinot Grigio that’s worth trying. 17 Jun	This entry was published on June 17, 2012 at 4:10 pm. It’s filed under Italy, Pinot Grigio, Tasting reviews, White Wines and tagged pinot grigio, white grapes, white wine, wine, wine review. Bookmark the permalink. Follow any comments here with the RSS feed for this post.